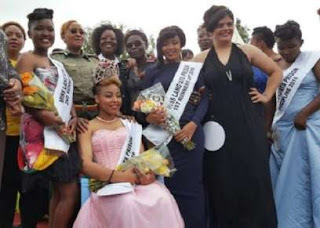 A 22-year-old Kenyan lady, Ruth Wanjiru Kamanda, who stabbed her boyfriend, Farid Mohammed, to death for allegedly cheating on her in 2015, has been crowned Miss Langata Prison 2016, in a beauty contest organized for female prisoners. It was gathered that Kamanda dusted 19 other contestants to the crown, with a Tanzania female convict, Tina Martin, in prison for drug related offense, emerging first runner-up, Susan Wairimu, who is in prison after participating in a robbery and murder-related crime, coming third. The victim who sustained stab wounds on his back, stomach, chest, and neck, later died in the hospital while undergoing treatment.